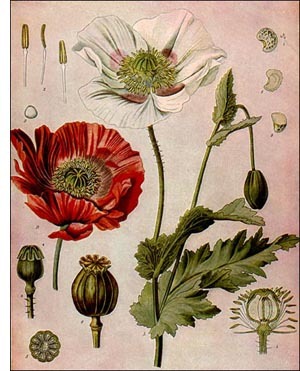 The opium-yielding plant or Poppy is an herb about three feet in height; stem of a pale green color, covered with a bloom. Branches are spreading, with large, simple, lobed, or incised leaves. The flowers are solitary, few in number, quite large and showy. The four large petals are white or a pale pink color in the wild growing plants. The fruit is a large capsule, one to three inches in diameter, of a depressed globular form. The seeds are small and very numerous, filling the compartments of the capsule. In spite of the general attractiveness of the plant, the size of the flowers, and the delicate coloring of its petals, it is not a favorite at close range, because of a heavy nauseating odor which emanates from all parts of the plant, the flowers in particular. The petals, furthermore, have only a very temporary existence, dropping off at the slightest touch. The wild ancestor of our familiar garden poppy is supposed to be a native of Corsica, Cyprus, and the Peloponnesian Islands. At the present time it is extensively cultivated everywhere, both as an ornamental plant and for its seeds, pods, and the yield of opium. It has proven a great nuisance as a weed in the grain fields of England, India, and other countries - something like mustard in the oat fields of the Central States. There are a number of forms or varieties of the cultivated poppy. The red poppy, corn poppy, or rose poppy is very abundant in southern and central Europe and in western Asia. It has deep red or scarlet petals and is a very showy plant. The long-headed poppy has smaller flowers of a lighter red color and elongated capsules, hence the name. The Oriental poppy has very large, deep red flowers on a tall flower-stalk.